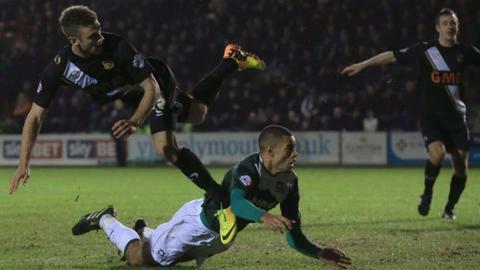 Ben Williamson's ninth goal of the season gave Port Vale a 2-1 win over Peterborough. Posh went ahead with Conor Washington's left-foot shot on 21 minutes, but Vale's Chris Birchall equalised before the break with a low shot. Marcus Maddison wasted a great chance for the visitors before Williamson capitalised on a mistake after the interval to score from 14 yards. Darren Ferguson's men have now won only one of their last 10 games. Match ends, Port Vale 2, Peterborough United 1. Second Half ends, Port Vale 2, Peterborough United 1. Nathaniel Mendez-Laing (Peterborough United) wins a free kick in the defensive half. Attempt missed. Jack Payne (Peterborough United) right footed shot from outside the box is just a bit too high. Joe Newell (Peterborough United) wins a free kick on the left wing. Corner, Peterborough United. Conceded by Chris Neal. Attempt saved. Joe Newell (Peterborough United) right footed shot from the right side of the box is saved in the centre of the goal. Aaron McLean (Peterborough United) wins a free kick in the defensive half. Attempt missed. Marcus Maddison (Peterborough United) right footed shot from outside the box is close, but misses to the right. Luke James (Peterborough United) wins a free kick in the attacking half. Corner, Port Vale. Conceded by Michael Smith. Substitution, Peterborough United. Aaron McLean replaces Erhun Oztumer. Substitution, Port Vale. Colin Daniel replaces Chris Birchall. Erhun Oztumer (Peterborough United) is shown the yellow card. Michael Brown (Port Vale) wins a free kick in the attacking half. Foul by Nathaniel Mendez-Laing (Peterborough United). Corner, Peterborough United. Conceded by Adam Yates. Attempt missed. Luke James (Peterborough United) right footed shot from the right side of the box is just a bit too high. Substitution, Peterborough United. Luke James replaces Harry Beautyman. Attempt missed. Louis Dodds (Port Vale) header from the right side of the six yard box is close, but misses to the left. Corner, Port Vale. Conceded by Scott Loach. Attempt saved. Ben Williamson (Port Vale) left footed shot from a difficult angle on the left is saved in the centre of the goal. Substitution, Peterborough United. Nathaniel Mendez-Laing replaces Kgosi Ntlhe. Attempt missed. Chris Robertson (Port Vale) header from the centre of the box is close, but misses to the right. Chris Birchall (Port Vale) wins a free kick in the defensive half. Louis Dodds (Port Vale) hits the bar with a right footed shot from outside the box. Hand ball by Michael Brown (Port Vale). Attempt missed. Mark Marshall (Port Vale) left footed shot from the right side of the box is just a bit too high. Attempt blocked. Carl Dickinson (Port Vale) right footed shot from the centre of the box is blocked.